Winter in the Midwest can be a very long season. And, while January is National Soup Month, we’ve got many months ahead of us where we need a piping hot bowl of soup to warm us up. 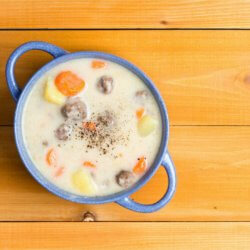 Here are three super easy “cheater’s” secrets to make piping hot, quick and delicious soup! Grab a can of your favorite cream of mushroom (or cream of chicken) soup. Cut up potatoes and carrots and simmer in the soup until tender. Add No Name Wild Rice Meatballs until warmed through. So delicious, so creamy and it warms you up from the inside! 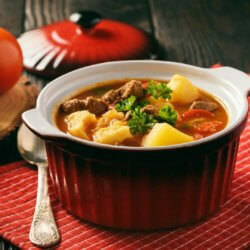 Don’t fight winter, just settle in and enjoy a hearty, steaming bowl of stew. Simmer onions, carrots and potatoes in beef broth (or stock). Cook your No Name Steak according to package directions. Add a bit of the hot broth/stock to 1-2 TB of flour to dissolve flour — add to stew to thicken. Add your tender, juicy, cubed No Name Steak and serve for the ultimate in cold weather comfort food.